Muhahaha and enter. This place in Warsaw, Poland, was once a fluorescent light factory. The plant was called many things but is known as “Polam” aka “Rosa Luxemburg.” Rosa was born in Poland in 1871, and was a philosopher, activist, and ideologist of the Polish and German worker’s movement. She was shot with a pistol to her temple. Her corpse was thrown into the Berlin Canal Division and not found until 1919. 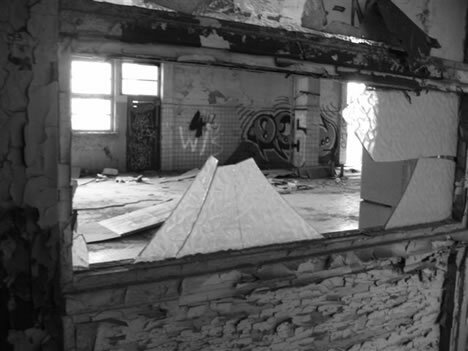 As turbulent as her life was, so too is the history of this abandoned factory. The sign on the right reads, “This building is out of order! 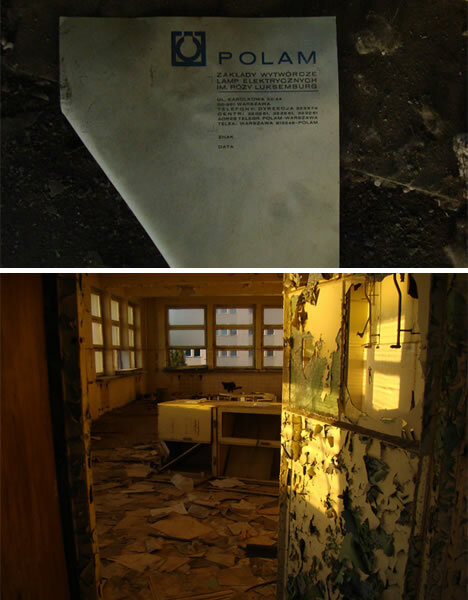 You are not allowed to enter because you may DIE!” Welcome to the abandoned Polam Philips factory in Poland. “Polam” manufactured fluorescent lights, mercury lamps and electron tubes. 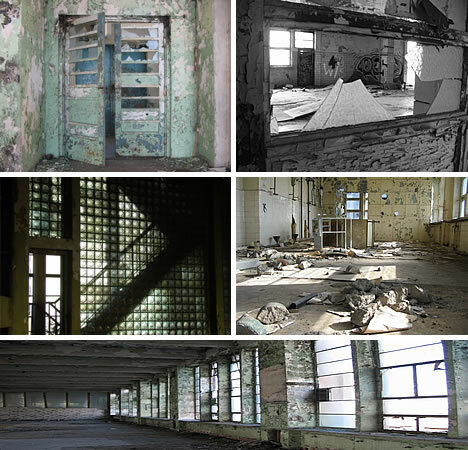 The factory was partially modernized before renovation stopped due to a very high mercury contamination. Through the trees, you can glimpse the abandoned Polam factory. On the upper right is the front main entrance for this production plant. 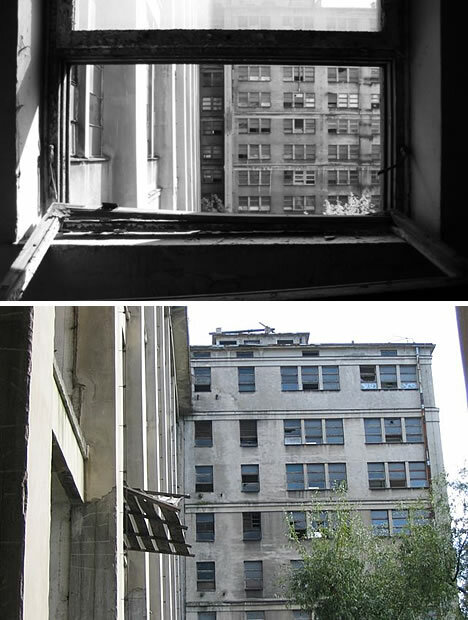 The bottom photo shows two of the many overgrown back entrances into the building. There is an underground floor, and the building has 10 floors above ground as well as a ladder leading to the roof. Like the wildly swinging door, this factory has had many names and many uses in the past. Construction started in 1922 and the plant produced light bulbs, radio tubes, insulated flask bottles, capacitors, resistors, coils, and scales. This was only the beginning for this factory. In 1939 – 1944, the Germans took over the Polam factory. The Nazis produced transceiver equipment for submarines, tanks, and aircraft. In 1944, the factory was taken back by insurgents during the Warsaw Uprising, but the Nazis stopped construction, dismantled equipment, and shipped everything to Germany and Austria before burning many of the factory buildings they had occupied. The door on the left leads to what was the W-3 Department of Mercury Lamps. Extreme levels of mercury is what shut this factory down. Oddly enough, its closing was right after a substantial dump of money to fix it up and right in the middle of renovations to bring this place back to its glory. Are There Ghosts Haunting the Halls of This Factory? 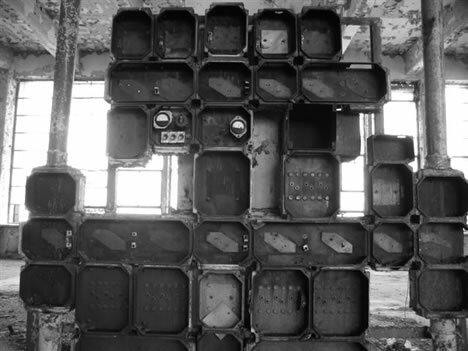 It is said by some that ghosts roam the halls of this abandoned factory, but no “proof” is readily available. 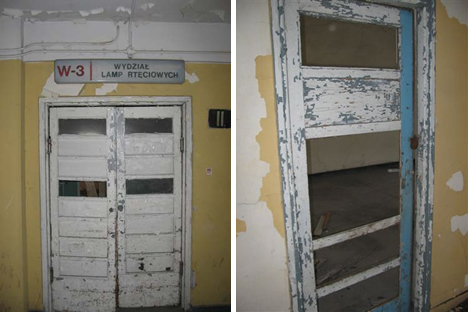 With such tempestuous, war-torn pasts of both Poland and this building, it is unknown how many individuals died here. It is even unknown how many were poisoned by mercury contamination and other chemical spills. Is There Beauty to be Found in the Decay? Is there beauty to be found among the decay? Scattered throughout the factory, old Polam pinups, plans, blueprints, and other documents can be found. The broken elevator on the top right is stuck almost in the middle. Some of the windowed corridors or floors are open, but some have coverings to hide away the light and keep anyone on the outside from looking in. The underground level and first floor are filthy and dirt covered. 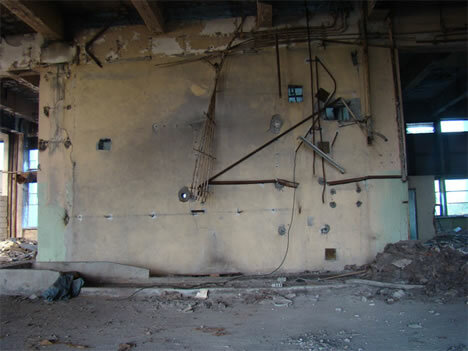 Rusty electric coils and cables hang among the ruins of this abandoned factory. There are items like boots, shoes, and drinking cups, items people used every day, left as if everyone deserted the building in a rush. Peeling paint and graffiti add dashes of color and character to a building complex with an already colorful past. 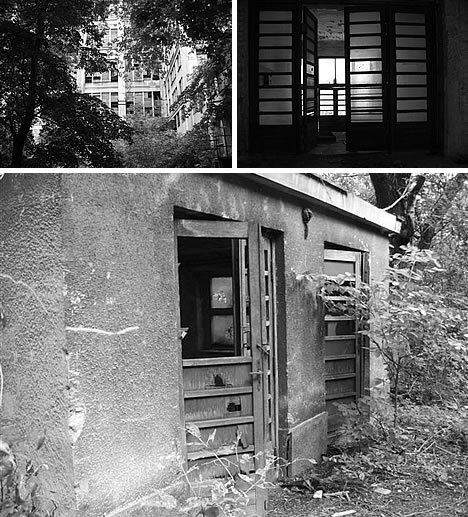 Many of the entrances are overgrown, but you can be sure many curious people still enter this abandoned factory. 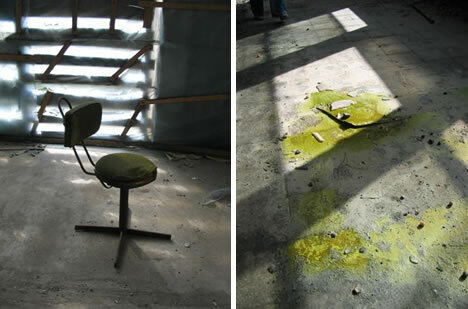 Above is what is left from an “electric wall.” The chair sits in the same room as chemical spills still staining the concrete floor. The mercury contamination, high enough to close down the place in a hurry, has never been completely cleaned up. 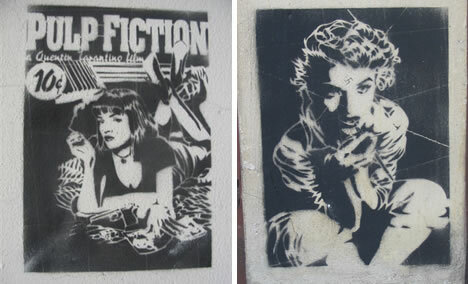 Some parts of the Polam building, very few in such a huge factory, were refurbished and are being used. Was Safety Ever Truly a Big Factor in this Factory? Fire extinguishers can be found in a multitude of photographs, but with the mercury poisoning levels so high in this factory, one might wonder how important safety was ever ranked there. One thing that can be stated with certainty was that this place came to a bad end. Fuses boxes, electricity walls, remnants of equipment and paperwork attest to the fact that this was a place where goods were produced. When Philips ran production here for fluorescent lights, this factory employed hundreds of workers. But this place passed ownership and production items throughout the years. Under the floors were “pools” of mercury, which poisoned many workers. Be it kids having vandal-type fun or workers who were ill due to chemical poisoning and later bent on revenge, this building is absolutely trashed in all the previous laboratories. Several layers of falling paint make the corridors and rooms pretty colorful yet still eerie with echoes of a tragic past. Gauges and switches remain for either trespassers or ghosts to play with. Every level, from the walk-out underground up past the 10th floor to the roof has abandoned equipment, blueprints or other company documents left behind in a hurry. 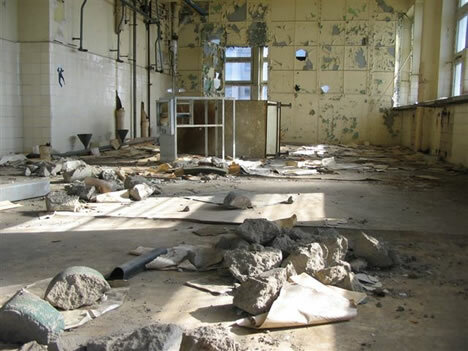 On nearly every floor, remnant containers of chemicals were abandoned when extremely high levels of mercury contamination shut this factory down for good. 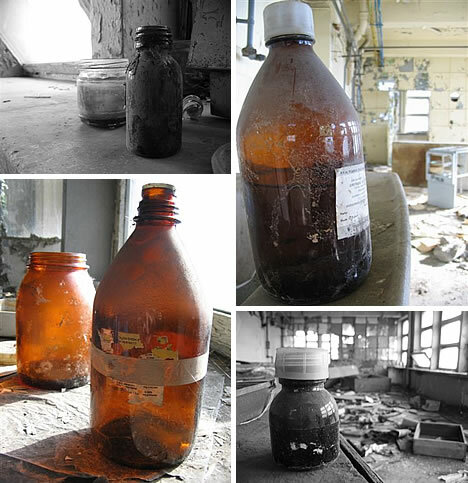 Besides ammonia and other chemicals, empty beer and hard liquor bottles can be found throughout the building. Like many abandoned places, despite the risk, people come into this one for everything from photographing the place to partying. 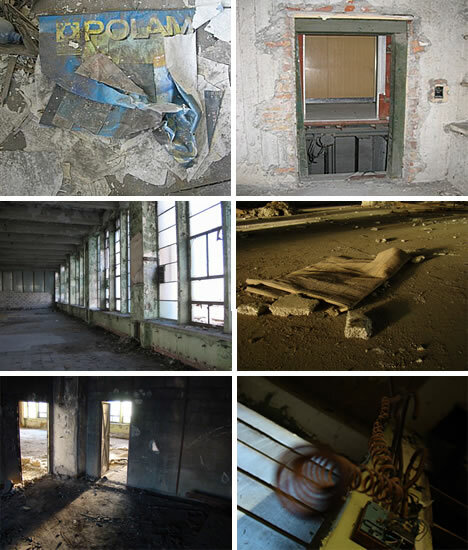 Here are more photos of the Polam abandoned factory. The top left storage cabinet was left locked. It is curious what might be inside, considering poisonous chemicals were neither cleaned up nor locked away. Most of the restrooms in this building have been ripped apart either by vandals or those looking for free “parts” as if this were a plumbing supply store. Most of the sinks as well as toilets are missing. 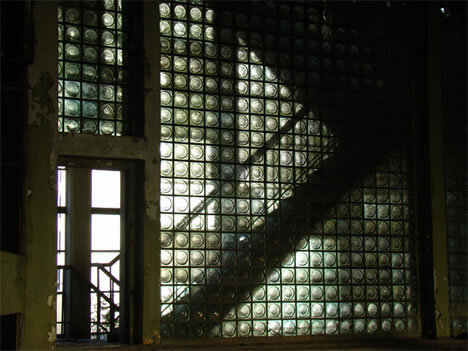 The glass wall next to the staircase is one of the still beautiful architectural elements left at Polam. With the elevators obviously out of order, the 10 flights of stairs are how curious people must get around inside the abandoned factory. 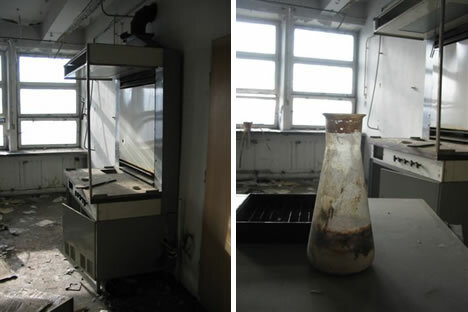 This laboratory still has the vent hood, test tubes, glass bottles and other assorted scientific equipment left behind to rot and fall to ruin. There are also rusted vents and a vent room as well as massive storage tanks on the upper levels of the abandoned building. The indicator or gauge above is only one of dozens, like fuse boxes and rusted cables throughout the building. In 1928, when the plant became Polish Phillips Company SA, one of the various products made there were radio valves. In 1944, the Philips Plant Buildings in Warsaw were burned and destroyed, therefore making this factory a place of trauma early on in its history. 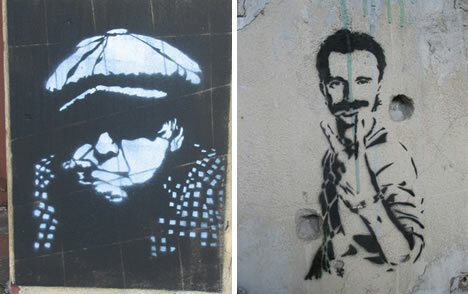 The terraces on the 6th and 7th floors are not the only place where graffiti thrives and wild birch trees try to grow. Looking out from the abandoned factory over Warsaw Centre, areas are renovated like a previous tram power-plant which is now a museum, Daewoo skyscraper, banks, and flats where people within Warsaw still thrive. 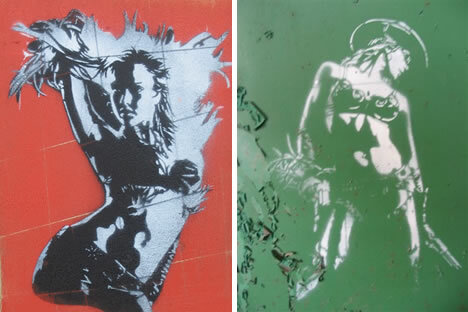 These are only samples of the graffiti found inside the abandoned factory, proving that people still come inside to “play.” It is unclear if the holes in the bottom right graffiti stencil are bullet holes. Unlike many of the rejected pieces of equipment, there are no signs of rust as if metal had been yanked from the wall. 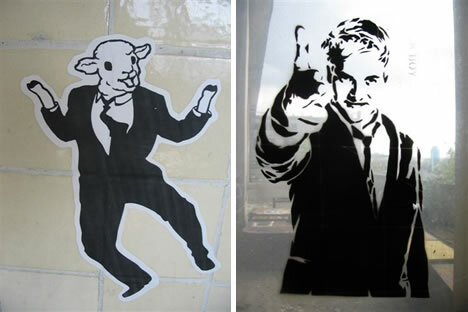 Whether you consider graffiti to be art or not, there are other clear signs of true vandalism throughout the building. 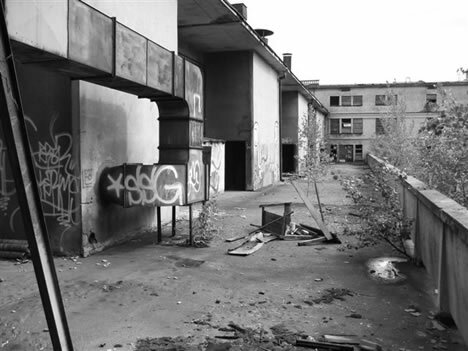 We thank the overly curious Urban Expedition in Poland photographers who ignore such posted warnings as “This building is out of order! You are not allowed to enter because you may DIE! 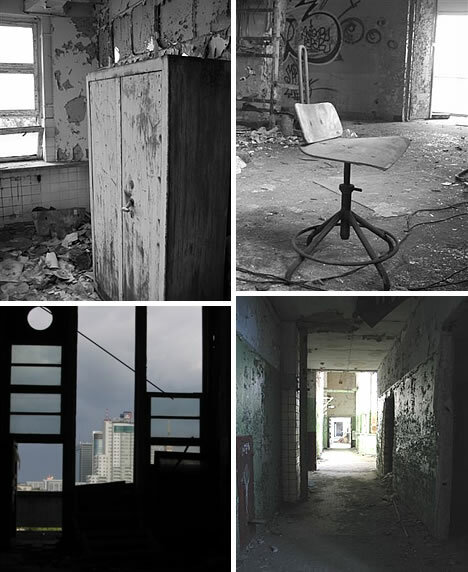 ” We thank those who roam abandoned buildings and factories such as Rosa Luxemburg Polam Light Factory Complex to share the decaying and mysterious, eerie interior with those of us who would not otherwise see such sights.